I was first introduced to Gloria in February 2012. Busy running a successful dental practice, Gloria had very little time to devote to exercise. Her workouts consisted of a brief stint at Curves and spending about 20 minutes a couple of days per week of “weight lifting” at home with light dumbbells. After having some personal medical conditions to deal with, Gloria understands the importance and value of one’s health. 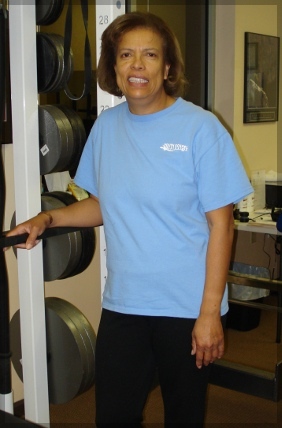 This understanding has motivated Gloria to improve her quality of life, physical fitness and energy levels. Her doctor encouraged her to hire a personal trainer and referred her to my care. I immediately liked Gloria’s drive and commitment and was eager to help her. To compliment her time in the studio and enhance her results, Gloria also incorporated nutrition counseling and at home exercises. In addition to her dramatic weight and body fat loss, Gloria’s posture (diminished by years of being hunched over at work) has improved significantly. Gloria often comments that she hasn’t felt this good since she was a young girl running freely. Gloria says that her family and friends have noticed the difference in her appearance and energy. She says that this encourages her to keep working on her fitness. Congratulations Gloria! You’ve come a long way. Here’s to you and your continued journey to Achieve Your Best!